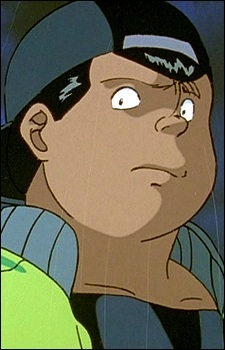 Kirishima, Okubo, and Sawamura (Komada in the English anime) are Kazuma Kuwabara's lackeys. Okubo's mother, often ill, does not bring enough money into her household, so Okubo holds a job in order to support the household. They also appear in the Chapter Black Saga where they attend the Megallica concert with Kuwabara. On their way home they are attacked by Kiyoshi Mitarai aka Seaman and nearly drown in one of Seaman's water-based monsters, but are saved by Kuwabara. Afterwards Kuwabara carries the three on his back along with Mitarai to Yusuke Urameshi's apartment before passing out. After Kirishima, Okubo, and Sawamura tell Kurama about what happened, Kurama erased their memories of this event so they would not be burdened with it and sent them home. In the first character popularity poll, Kirishima ranked 9th place with 219 votes.